When the Warner Bros. World Abu Dhabi opens this summer, it will feature six immersive lands including DC's Metropolis and Gotham City, as well as Cartoon Junction, Bedrock, Dynamite Gulch and Warner Bros. Plaza. Miral, Abu Dhabi&apos;s creator of destinations, announced today that Warner Bros. World Abu Dhabi, an indoor theme park, will open its doors to the public on 25th of July 2018. 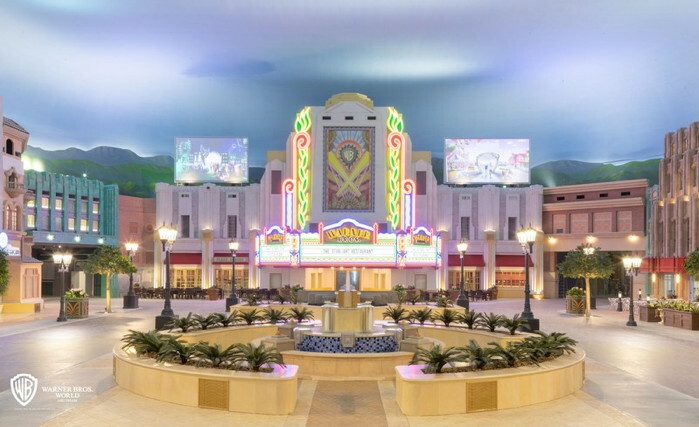 When the Warner Bros. World Abu Dhabi opens this summer, it will feature six immersive lands including DC&apos;s Metropolis and Gotham City, as well as Cartoon Junction, Bedrock, Dynamite Gulch and Warner Bros. Plaza. "The launch of Warner Bros. World Abu Dhabi is yet another milestone in the Emirate&apos;s journey to further enrich its tourism offering, and help establish it as one of the world&apos;s leading tourist destinations. The park is another great addition to Yas Island&apos;s immersive experiences and award-winning attractions," said His Excellency Mohamed Khalifa Al Mubarak, Chairman of Miral. "It gives us great pride to have partnered with Warner Bros. Consumer Products to launch the world&apos;s largest Warner Bros. branded indoor theme park right here in Abu Dhabi. As part of our fulfillment to Abu Dhabi&apos;s ambition to drive increased visitors and enhance the UAE&apos;s appeal as an international destination, we are thrilled that fans will be able to enjoy the outcome of this partnership and the massive, fun and engaging park offerings in a few months," he continued. The 1.65 million sq ft park promises to deliver guests with captivating experiences this July, bringing together some of the world&apos;s most iconic characters and stories under one roof for the first time in the region. Featuring a total of 29 state-of-the-art rides, interactive family-friendly attractions and unique live entertainment, as well as a variety of authentically themed dining and shopping outlets, the park&apos;s incredibly immersive environments, unique thrill rides and fan-favorite characters will create a truly unparalleled experience for all who visit. "We have worked tirelessly with our partners at Miral to faithfully bring iconic franchises such as DC Entertainment, Looney Tunes and Hanna-Barbera to life in a truly immersive and authentic environment," said Pam Lifford, President, Warner Bros. Consumer Products. "Delivering experiences and products that continue our brands&apos; storytelling and excite and engage fans is our primary goal, and we look forward to sharing this world-renowned attraction with them this summer." The excitement begins at Warner Bros. Plaza, an Art-Deco inspired land that celebrates the Golden Age of Hollywood and all things Warner Bros. A portal to the rest of the park, this land is famed for its All-Star Spectacular, a majestic show that brings the Warner Bros. film library to life. As guests step through to Metropolis, they will discover a gleaming urban landscape protected from evil by DC Super Heroes like Superman and other members of the Justice League including Wonder Woman, The Flash, Green Lantern, Cyborg and Aquaman. On the dark streets of Gotham City, guests will have the chance to walk alongside notorious DC Super-Villains such as The Joker, Harley Quinn, and The Riddler. Watch these criminals disappear into the shadows when Batman arrives to bring them to justice. In Cartoon Junction, childhood memories come to life under year-round sunny skies alongside beloved characters including Bugs Bunny, Tom and Jerry, and Scooby-Doo. The Yabba-Dabba-Doo begins in pre-historic Bedrock, were guests will meet everyone&apos;s favorite modern stone-age family, The Flintstones. Venturing into the animated storyland Dynamite Gulch, guests can experience Wile E. Coyote and the Road Runner&apos;s dizzying dash firsthand, and keep an eye out for Marvin The Martian and The Jetsons. Warner Bros. World Abu Dhabi will complement Yas Island&apos;s destination offering of entertainment and leisure, which today, includes iconic attractions such as Ferrari World Abu Dhabi, Yas Waterworld Abu Dhabi, Yas Marina Circuit - home of the Formula 1 Etihad Airways Abu Dhabi Grand Prix, Yas Mall, as well as a wide variety of world-class entertainment venues, restaurants and hotels. To learn more about Warner Bros. World Abu Dhabi or purchase tickets, visit http://www.wbworld.com.